Teehee. Sorry. I had to do it. Check out Sandi’s post on this same subject here. Buying for one’s stash is an incredibly personal decision, dictated by several factors. Time, money, our mood at the moment, current fabric availability, current fabric trends… I could probably go on. And on. And on. Anyway, I decided to take a slightly different road from Sandi’s post on buying for the stash. She goes into a lot of great details, that you don’t need to read twice. 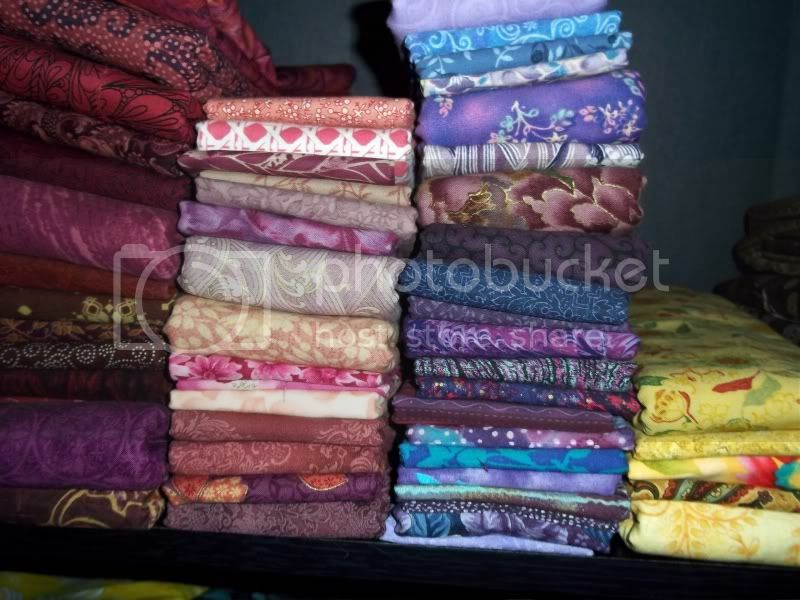 I decided to discuss what makes me buy something for my stash, so let’s dive right into that. First of all, I’ve really only been buying with the intent to stash for about five years. ‘Intent to stash’. What do those words say to me? When I buy fabric with the intent to stash, that means that I know darned well that I’m not going to cut into in the near future. Near future being in the next week or two. If I’m going to be cutting into it within that time frame, I’m buying with a project in mind. But I digress… Back to intent to stash. I know I’m not nearly as bad as some individuals about buying fabric just to have it. I’m actually pretty proud of that. 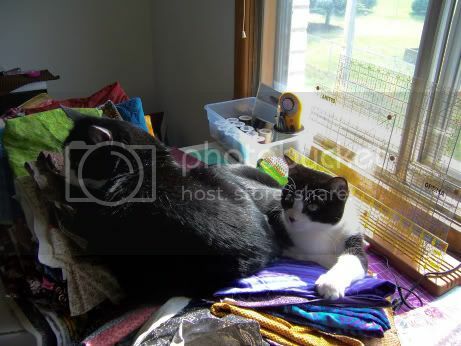 I don’t have unlimited space – I live in a two bedroom apartment that I share with my husband, son, and three cats. So, I have to be pretty picky about what I pick up for the stash – I have to have a place for it all to live. However, I’m right with Sandi when it comes to the things I look for when buying for the stash: Color, Value, Print, Scale and Quality. Let’s start with Quality because it’s a quick and easy one to get out of the way. I do not buy exclusively from quilt shops. I do a lot of purchasing from my local Joann’s, as well as from online discount retailers like fabric.com. But with that said, I do my best to ensure that what I bring home isn’t something I’m going to regret. If I can see through, it doesn’t come home at all. I like cottons with a smooth finish and clean printing. I like it to have weight to it, a solidity if you will. Now, I know that sounds a lot like Sandi, but I think it bore repeating. Most importantly, be happy with what you take home. I can’t comment on the lighter weight fabrics that have become popular, like voiles, because I haven’t used them. I’ll be honest though… I’m not especially jazzed to try them either because I haven’t seen any that really trip my trigger. I love color. It’s the motivating factor for me when I purchase fabric for my stash. But because of that, I can go very long periods without buying for my stash. This is due to the fact that there are ‘in-season’ colors as well trendy colors. Past years where pastels or were super hot – I pretty much stayed out of fabric stores. The top two shelves contain everything that is one full yard or less, organized by color. Since I do a lot of scrappy quilts, I buy a lot of fabric at this quantity. 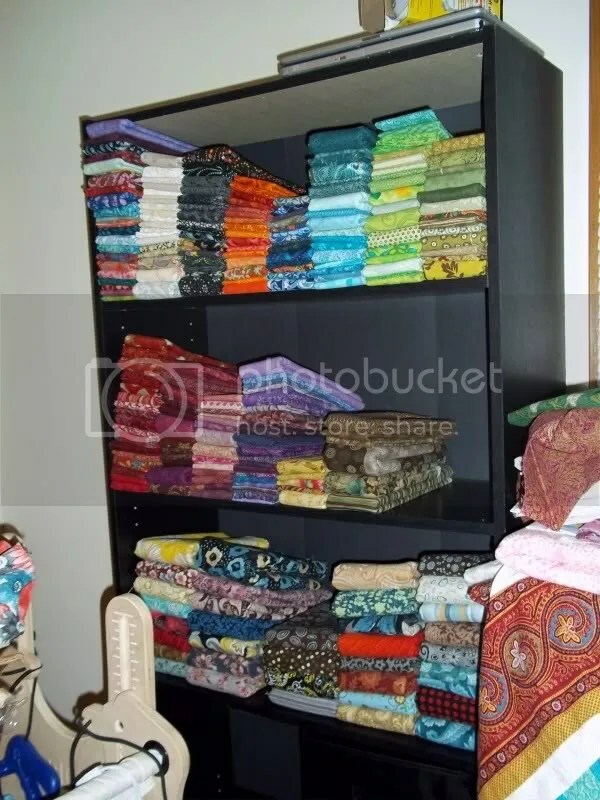 The third shelf contains the fabric that is over one yard in length. I don’t have as much there, at the moment. The shelf was full last summer. I used quite a bit of yardage from the stash for the Christmas Cactus Quilt and for the Piecemeal Quilts Friends and Family Basket Blocks top. As you can see, I don’t buy a lot of brown or yellow. The yellow thing is due to the fact that I really don’t like bright yellow. I prefer mustard or turmeric yellows, shades that start veering into brown and rust. Brown is simply not my choice of neutral, though if you look in the top left corner, I clearly have a white/cream and gray/black obsession. I’ve been accused of liking ugly fabrics because I tend to buy some really off the wall shades. But that’s because I like to include zinger fabrics. These are one section for me, because they’re inextricably linked in my head. I love solids, but they make up less than 5% of my fabric purchases over the course of a normal year. 2011 is the exception to that, because I am doing a Dear Jane. I buy them in both small scale and medium scale prints. Occasionally, there’s a large scale tone on tone, but that’s not common for me. Honestly, this buying habit is something that seemed pretty unconscious for me. On the surface, they’re just what I’m attracted to. Thinking about it though, I realize it is actually a conscious choice. Buying primarily in the tone on tone, or ‘reads as solids’ group, I have of a lot of options open to me. I normally piece in smaller units, so I don’t lose the pattern at all. 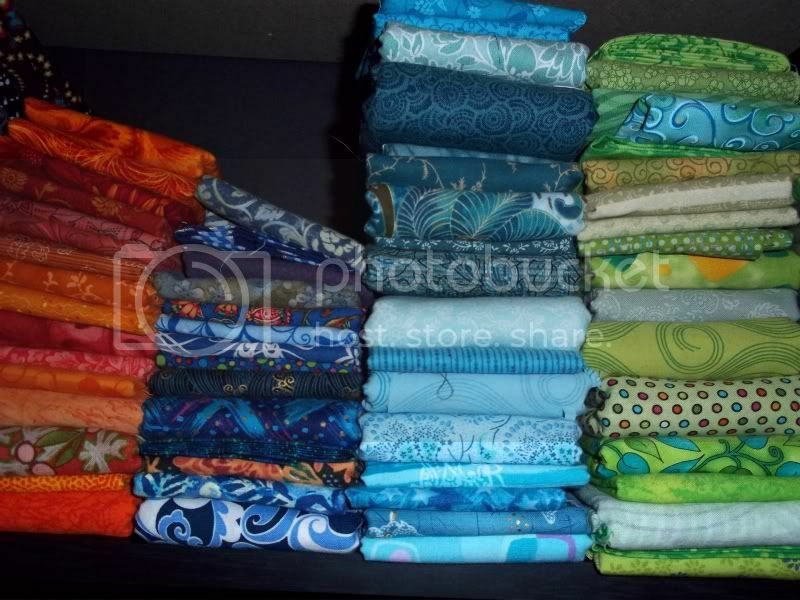 My stash can go into a wider range of quilts. Scrappy quilts are much easier. These purchases tend toward more versatility, and age better than other prints. I regret far fewer purchases this way. They are almost inevitably very limited in color palette, and they’re something I use as a leaping off point for pulling the other fabrics for a quilt. I have fewer colors to worry about matching, which is awesome as colors go in and out of fashion. Finding a zinger fabric (something that stands out to draw the eye) is so much easier, because I simply pick that’s not even in the large scale print. 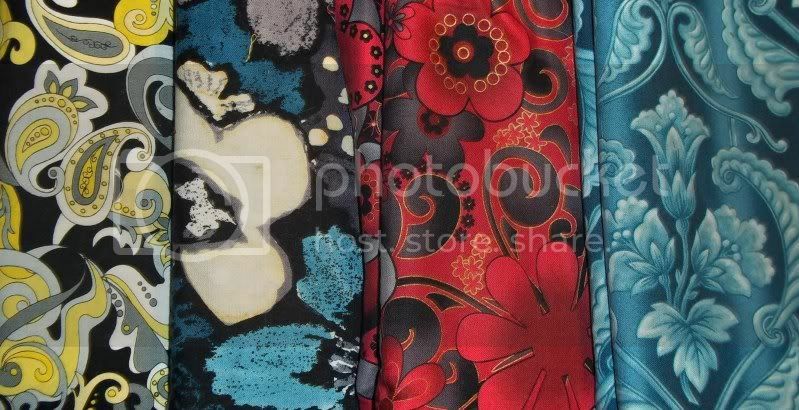 For instance, the fabric on the far left with the yellow, gray and white on the black background? I’m thinking aqua would work well as a zinger. Value is just as important as color, in order to create a sense of movement in a quilt. Sandi showed off some great examples of this in her post, so I’m not going to re-illustrate for you. Instead, I’ll just encourage you to purchase fabrics in a wide range of colors and values – you’ll be so glad you did, in the long run. Now, you’ll notice I didn’t touch on pre-cuts, or vintage, re-purposed fabrics. I don’t buy pre-cuts. This is because pre-cuts highlight a single line, in all the color ways. I find that tremendously boring. I also end up feeling extremely limited and frustrated by the fact that they are pre-cut. 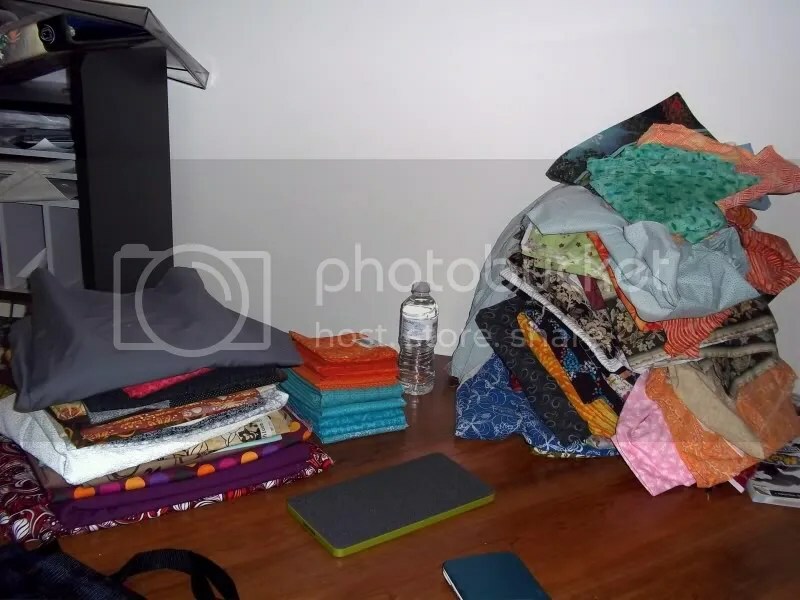 I’d much rather be the one to decide how my fabrics are sliced and diced, and I dislike losing the nature of a large scale print to a small shape. As for vintage or re-purposed fabrics, typically, they’re not something that I like. Most old bed linens tend to be large florals in pastel shades. That’s just a double whammy of ‘no’ for me. As a buyer, it pays to be aware of changes in the market. You want to know when the stuff you like is moving out of stores. I take that as my last chance to stock up. Keep an eye on your local department stores and clothing boutiques to see when displays change, and when seasonal goods start getting shifted around. See what colors are being used in clothing and home goods ads to determine if you need to start stockpiling the stuff that you liked but either didn’t buy a lot of or put off. I personally don’t keep tabs on what fabric is coming out when, but that’s also a very good indicator of when these industry mandated change overs in trendy/popular colors are about to take place. When retailers offer an additional markdown on their clearance fabrics is a good sign that an influx of new product is about to hit the shelves. I very rarely buy less than a yard of whatever fabric happens to make it into my cart. I don’t make small quilts for myself. I prefer them to be a generous lap-sized quilt at the least, but prefer something that can fit on my queen size. If I’m looking at a large scale print, I’ll almost always buy two yards, so that I can retain as much of the image as possible, as well as to incorporate it in either the backing or a border. I’ve been known to buy fat quarters, when there is really no other option if I want to obtain a certain color. I’m not really into them, because of their cost. Since I’m careful to buy my yardage at sale prices, fat quarters actually end up being prohibitively expensive. Hopefully, this all will help you the next time you go fabric shopping. If I need to clarify anything, please leave a comment and I will get right back to you.